Apple margaritas are a lot of fun to drink and a favorite flavor among the many different margaritas you could mix up. While there are a variety of recipes out there, this apple margarita is one of the better options because it doubles up on the fruity flavor. This particular recipe works both frozen and on the rocks. It's often made with Apple Pucker, though any brand of apple liqueur will do just fine. When made with Pucker, the cocktail gets a brilliant green color and the apple juice helps bring balance to the drink, taming down that tart punch the liqueur is known for. If desired, wet the rim of a chilled margarita glass with the apple liqueur and rim the glass with a mixture of 1 part ground cinnamon and 2 parts white sugar. Combine the ingredients in a blender and blend until smooth. Pour the drink into the prepared glass. Garnish with a green apple wedge. Though it's tempting to pour an inexpensive tequila into a cocktail like this, you'll find it tastes better with a mid-range tequila. Choose something you wouldn't mind drinking straight to create a good foundation for the cocktail. Blanco tequilas are a good choice. Any apple schnapps will work as a substitute for Apple Pucker. If you want a more relaxed apple flavor that's not as tart, try something like Berentzen Apple Liqueur. Homemade sour mix takes about 20 minutes to make and it's easy. If you have simple syrup, simply add equal parts lemon and lime juices to taste. You can also make the citrus-flavored syrup on the stovetop or in your cocktail shaker. Whenever you're garnishing with an apple slice, dip it into lemon juice immediately after cutting it. This will halt the oxidation process that's responsible for the fruit's flesh turning brown, which doesn't look very appealing. 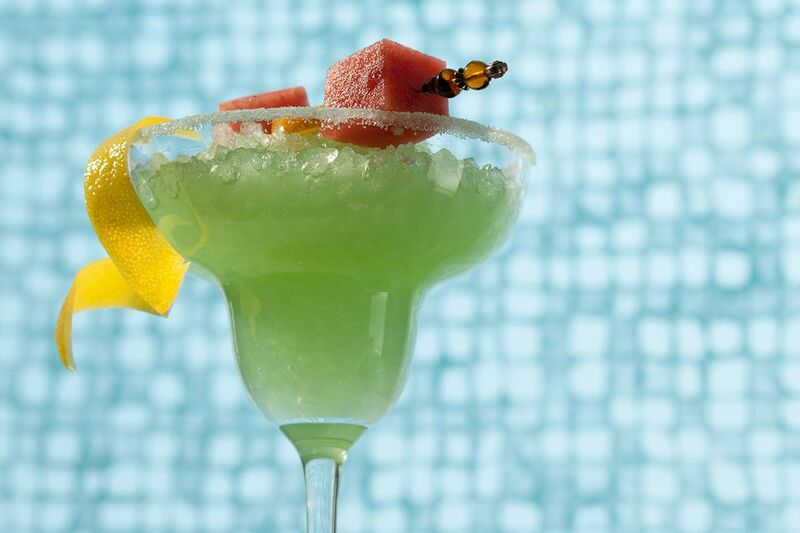 To make a shaken apple margarita, simply pour the tequila, apple liqueur and juice, and sour mix into a cocktail shaker. Give it a really good shake, then strain into the prepared glass over fresh ice. How Strong Is an Apple Margarita? The frozen apple margarita is a very light cocktail. When made with Apple Pucker and an 80-proof tequila, it blends up to a mild 7 percent ABV (14 proof). If you opt for the shaken version, the alcohol content doubles to about 14 percent ABV (28 proof). Even that is equivalent to drinking a glass of wine.